PALESTINE: Palestinian activists have devised plans to set up another tent village in the occupied Palestinian territories as a sign of protest against Israel’s settlement policies. The exact location of the planned tent village has not been announced yet, but it is expected to be set up at the site of Israel’s future settlement projects, referred to by the Israelis as E1. The move came following a forced evacuation of some 200 Palestinian and foreign activists, who had set up makeshift tents in the Israel-occupied Palestinian territory of the West Bank on Friday to confront a recent Israeli plan to construct new settlement units in the area. It is the second time that the pro-Palestine activists are using the tactic to protest against Tel Aviv’s settlement construction policies. 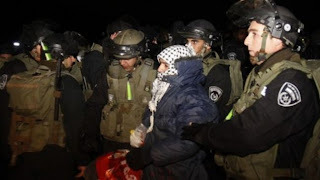 On Sunday, Israeli forces attacked the activists’ tent camp and forcibly evacuated them. Palestinian protesters said that at least six activists were wounded in the attack. UN Secretary-General Ban Ki-moon on Monday slammed Israel’s attack on peaceful Palestinian protesters, calling the protest non-violent. Ban reiterated that the Palestinians reserve the right to stage peaceful demonstrations, urging Israel to respect the inalienable right of the Palestinian people. The UN chief also called on Israeli Prime Minister Benjamin Netanyahu to abandon his new plans of settlement construction in the West Bank. Despite international condemnations, Israel has announced new plans to construct 170 new settler units and 84 “guest rooms” in the West Bank region. The E1 project aims at connecting the West Bank settlement of Maale Adumim to the occupied Palestinian territory of East al-Quds (Jerusalem), about six kilometers away. The plan will cut off the northern part of the West Bank from the south. More than half a million Israelis live in over 120 illegal settlements built since the 1967 Israeli occupation of the West Bank and East al-Quds. The UN and most countries consider the Israeli settlements illegal because the territories were captured by Israel in the 1967 war and are hence subject to the Geneva Conventions, which forbid construction on occupied lands.